Sun Bets, the ailing bookmaker launched less than two years ago by the publisher of The Sun newspaper and Australian gambling giant Tabcorp, ceased trading on Thursday – although the brand may yet be resurrected. A message on the firm's website on Thursday told customers they should withdraw their funds immediately, although account holders were reassured by email that their funds were safe. Tabcorp had warned last October that trading had been disappointing since Sun Bets launched in 2016 and the business was the subject of a strategic review. They will now have to pay Rupert Murdoch's News UK £39.5 million to pull out of their agreement, which had been set to run for an initial ten years. Tabcorp's chief executive David Attenborough said: "The performance of Sun Bets has been below expectations and we do not expect a material improvement over the next 18 months. As such, we have reached an agreement with News UK to exit the agreement. "While we didn't get it right, we have taken valuable learnings from the Sun Bets start-up process and operations which will inform our approach across our portfolio. "I would like to acknowledge the Sun Bets team for their efforts in building the business from start-up phase. We continue to have a strong relationship with News Corporation." 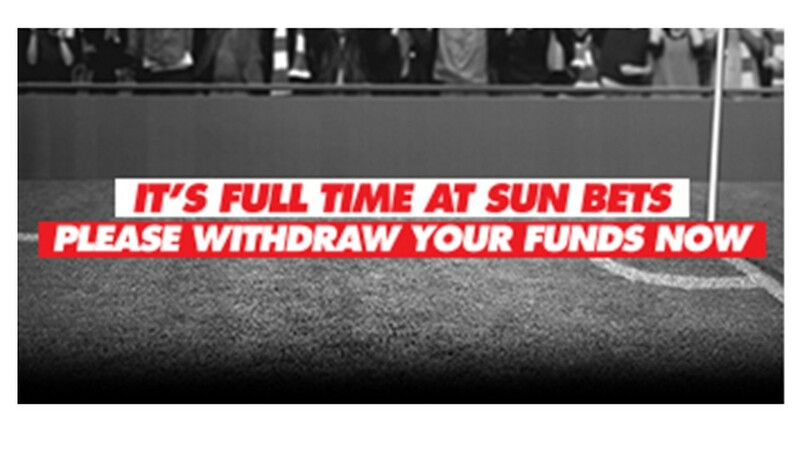 A message on the Sun Bets website told customers that Tabcorp had ceased providing gaming services on behalf of Sun Bets, adding: "Please withdraw any funds you may hold with us immediately." An email to customers said that if funds were not withdrawn by August 2 Sun Bets would attempt to refund balances through the card registered to the account, and if that was not possible they would attempt to contact them directly. However, Sun Bets warned if they were not able to return funds by September 17 they would donate the money to Gamcare. Sun Bets sponsored the Stayers' Hurdle at the Cheltenham Festival with their three-year deal due to run out after next year's race. While the Jockey Club may need to find a new sponsor for the race next year it is understood the agreement is with News UK so another of their brands could step in. The firm also became one of the sponsors of the all-weather championships in 2016 with the agreement again being with News UK. A spokesman for Arena Racing Company said: "We have been very happy to work with the Sun Bets team since 2016 and are very sorry to hear this news. We wish them all the best going forward. "Our contractual obligations with News UK remain unaffected and we look forward to working with them on delivering the remainder of our agreements under one of the News UK brands." The news does not necessarily mean the end of the Sun Bets brand, with online gambling software company Playtech, which operates the Sun Bingo brand, reported to have been in talks with News UK to take over the contract. News UK would not comment on those reports, but a spokesperson said in a statement: "The Sun is the number one newspaper and digital newsbrand in the UK and we have launched many successful brand extensions such as Sun Bingo and Dream Team. "We are increasingly confident in the reach and power of the brand and will firmly remain in the betting and gaming business. We now look forward to executing our vision." While Sun Bets attracted more than 300,000 registered users in its two years operating it was soon evident that the business was ailing, with Tabcorp last June announcing a "reset", including a change in leadership and redundancies. Tabcorp said they will record a loss of A$91m (approx £51.4m/€57.6m) against Sun Bets in their full-year accounts, up from A$52m in the first six months of their financial year. They also expect to incur other closure-related costs of up to A$10m. In April the Gambling Commission imposed an £84,000 penalty on the firm and carried out a licence review over the 'Piegate' stunt, when Sun Bets offered 8-1 that Sutton United goalkeeper Wayne Shaw would eat a pie in the dugout on camera during a televised FA Cup tie against Arsenal last year. News UK and Tabcorp announce plans to launch Sun Bets the following year. News UK chief executive Rebekah Brooks said the aim was to see the brand "firmly established as a key player in the online betting business". Sun Bets are named as one of the new sponsors of the all-weather championships. Sun Bets expand their sponsorship portfolio by signing a three-year deal to back the Stayers' Hurdle at Cheltenham. Tabcorp partly blame the cost of launching of Sun Bets for them recording reduced profits. Later in the month the firm gets unwanted publicity due to the 'Piegate' incident after offering odds that Sutton United's reserve goalkeeper Wayne Shaw will eat a pie during an FA Cup match with Arsenal, which he duly does. Tabcorp announce Sun Bets are to undergo a "reset" including a change in leadership and redundancies. Chief executive David Attenborough describes Sun Bets' performance as "disappointing" as the operation's losses push Tabcorp into the red. Tabcorp warn they will give "serious consideration" to ending their involvement in Sun Bets should the operator's performance not improve. Sun Bets have their licence reviewed by the Gambling Commission and are hit with an £84,000 penalty over the Piegate stunt. Tabcorp confirm they are in talks with News UK to pull out of their deal to run Sun Bets business.